In Pokémon Go, each species of Pokémon have three base stats: Attack, Defense, and Stamina. All Pokémon of the same species will have the same base stats. The stats are fairly straightforward: A Pokémon’s Attack stat affects the damage its attacks will deal, Defense affects the amount of damage a Pokémon receives from attacks, and Stamina affects the Pokémon’s maximum HP. Unfortunately, these base stats are not clearly stated in game, so you’ll have to rely on a Pokémon’s Combat Power (CP) to determine its overall combat ability. If you’re willing to do a little extra research, you won’t be completely left in the dark. You can find a table listing all Pokémon base stats in Pokémon Go on Bulbapedia. There are also numerous helpful mobile apps that let you check a Pokémon’s base stats on the fly (we’ll get into those later). As with main series Pokémon games, some Pokémon species are just intrinsically better than others. Certain Pokémon will, unfortunately always be weak, regardless of how great their IVs are, due to low base stats. A Pokémon’s base stats will never change. Pokémon in Pokémon Go also feature Size and Weight stats, but these have absolutely no effect. Fans of main series Pokémon games are likely familiar with the tiny pool of moves which are affected by a Pokémon’s weight, such as Heavy Slam or Grass Knot. This is not true in Pokémon Go, Weight along with Size are completely arbitrary. At least it is a little fun to see just how high an Alolan Exeggutor can tower over its peers. 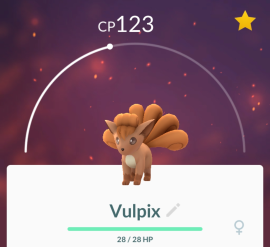 A Pokémon’s CP represents its strength in battle and is determined by a Pokémon’s base stats as well as hidden stats called Individual Values (IV). 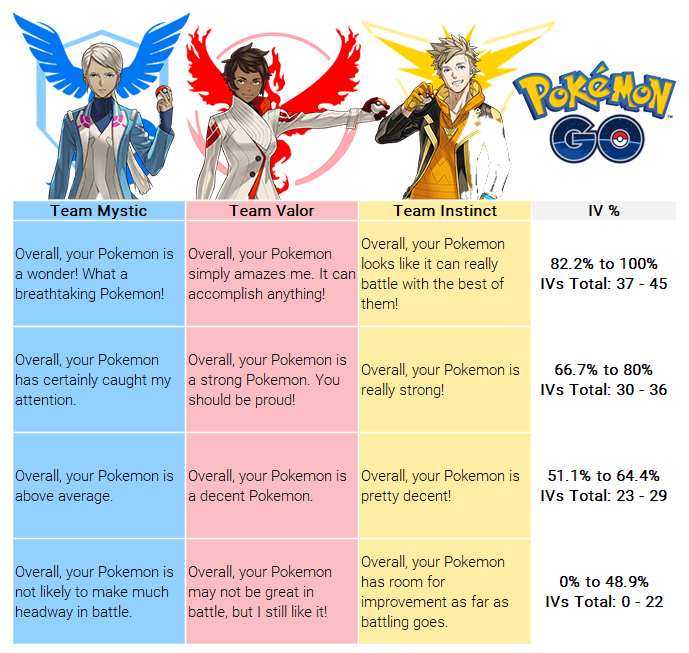 IVs are essentially a measure of a Pokémon’s potential. A Pokémon’s maximum CP is also determined by its species; Some Pokémon will just naturally have lower CP values when compared to others. Don’t judge a Pokémon by it’s CP, as its stats, type and moves are what matter the most when considering it’s actual performance in battle. Higher CP Pokémon will generally have higher base stats, as those are certainly taken into account when calculating CP, thus having an effect on a Pokémon’s overall performance. It’s worth noting that CP can be drastically weighted in favor of attack, meaning that Pokémon with a high Attack stat will have significantly higher CP than those without. However, just because a Pokémon’s Attack is high doesn’t necessarily make it a great Pokémon to use for battles. If its Defense is low, it may get knocked out more easily than others. This is where IVs can significantly come into play, as they can offer increases to a Pokémon’s otherwise low base stats. Because all Pokémon in a single species feature the same base stats, an individual Pokémon’s IVs determine whether it’s stronger than another in its species. 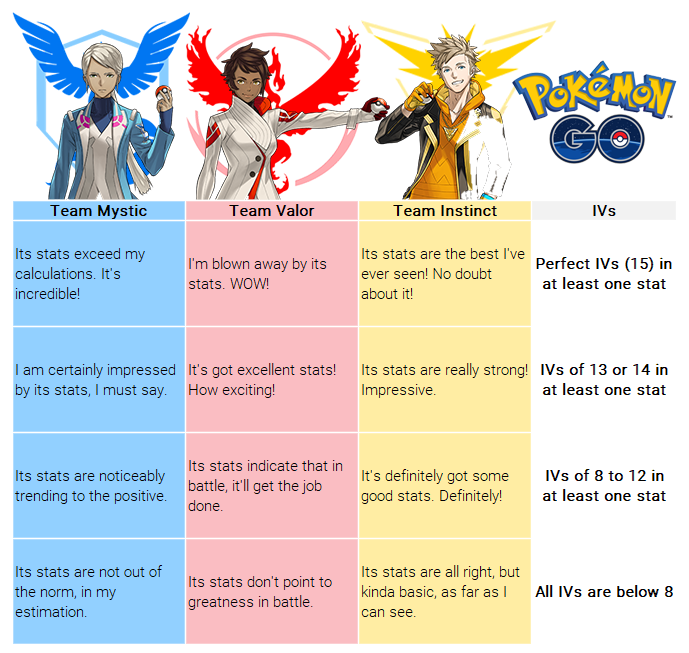 Therefore, a Pokémon’s IVs are generally the most important factor to consider when determining whether to invest Stardust in powering it up. Unfortunately, a Pokémon’s IVs are hidden, but can be easily checked with online and mobile tools. It’s worth noting that while a Pokémon’s base stats will never change, its IVs can change when traded to another Trainer. This feature exists ultimately to prevent creation of a market for perfect IV Pokémon, and can be just as detrimental as it can be beneficial. A Pokémon’s IVs are completely randomized when traded, so there’s no way to guarantee that a Pokémon traded with great IVs will still be great once it’s received. Additionally, a Pokémon can be traded only once, so there will be no trading back and forth until the Pokémon rolls good IVs. Learn more about trading in Pokémon Go in our helpful guide. While a Pokémon’s IVs are hidden from players, you can get some hints to help determine your Pokémon’s IVs by using the Appraisal feature. 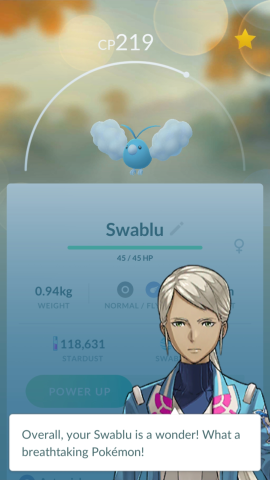 When you Appraise a Pokémon, your team’s Leader offers some insight into that individual Pokémon’s power, hinting at its IV ranges. Of course, they won’t flat out tell you, “Oh hey, your Pokémon’s Attack IV is 13!,” that would be too simple. Instead, they offer somewhat cryptic lines of dialogue that give you a general idea of your Pokémon’s stats. We’ve deciphered some of their statements below. Each team leader features different dialogue for their appraisal of a Pokémon, though will share insight on the same features of a Pokémon regardless of which team you’re a part of. To select a Pokémon to be appraised, simply tap on the Pokémon you wish to learn more about, then select “Appraise” from the menu at the bottom right. Your Team’s Leader will show up to tell you more about that Pokémon. As a reminder, a Pokémon can have up to 15 points in each of three IVs, for a total value of 45. We've left out the size-related comments, as you can clearly see a Pokemon's size by checking its profile, making its inclusion in the Appraisal is basically as useless as the attribute itself. Your team leader will then let you know which of your Pokémon's stats (Attack, Defense, or HP) is the highest, and if any of its other stats are equal. A Pokémon’s entry features an arc shown below its CP number. Contrary to popular belief, the arc doesn’t represent a Pokémon’s CP. Instead, the arc represents the Pokémon’s current level relative to your own Trainer Level and its growth potential. When your Trainer Level increases, you essentially raise the CP cap for your Pokémon, as it’s possible to Power Up until the Pokémon is 1.5 levels higher than your current Trainer Level. Pokémon with a lower dot on the arc is lower level and has more growth potential until reaching its current level cap. A Pokémon with a higher dot on the arc is closer to your own level, and a maxed arc means it is equal to or 1.5 levels higher than your current Trainer Level. Once your Trainer Level increases, the arc will move backwards denoting the availability of power gain from Powering Up, and will move back up to max once the Pokémon has been Powered Up to its maximum for your level. As a Pokémon is Powered Up and gains more levels, its CP will increase. As CP is determined by species and IVs, it’s possible to calculate a Pokémon’s maximum CP once you know its IVs and level. The amount of CP a Pokémon will gain upon Powering Up is determined by its IVs, as well as the level and species of the Pokémon. A Pokémon’s CP has no determination on how much damage it will deal in battles, as this is based on the Pokémon’s Attack IV as well as the power of individual moves (more on this below). When a Pokémon is defending a Gym, it will lose Motivation upon defeat which will lower its CP unless increased by feeding Berries. It’s important to note that the higher the Pokémon’s level, the less CP it will gain per Power Up. Once a Pokémon reaches level 30, its CP gains from from Powering Up will be roughly halved. Therefore, Powering Up past that point is generally considered too minor of an upgrade for the incredible amount of Stardust required. If you happen to have a large surplus of Stardust, as many active players do, then feel free to continue Powering Up to the Pokémon’s maximum level of 40! We’ve listed the costs for Powering Up a Pokémon at each level range below. Pokémon will gain additional base stats, and thus an increase in CP, every time they Power Up. Each Power Up grants one half of a level, up to a maximum level of 40. As mentioned before, a Pokémon can be Powered Up only to 1.5 levels higher than your current Trainer Level. Each Power Up has an associated Stardust cost and requires a certain amount of that species’ Candy. This cost, combined with the arc mentioned above, can help you estimate the current level range of your Pokémon within four Power Ups. While there are numerous formulas you can use to learn more about your Pokémon's stats, it’s obviously significantly easier to simply use one of the many great calculators available online. There are also quite a few extremely useful mobile apps which are recommended to help you check your Pokémon while you’re actually playing Pokémon Go.